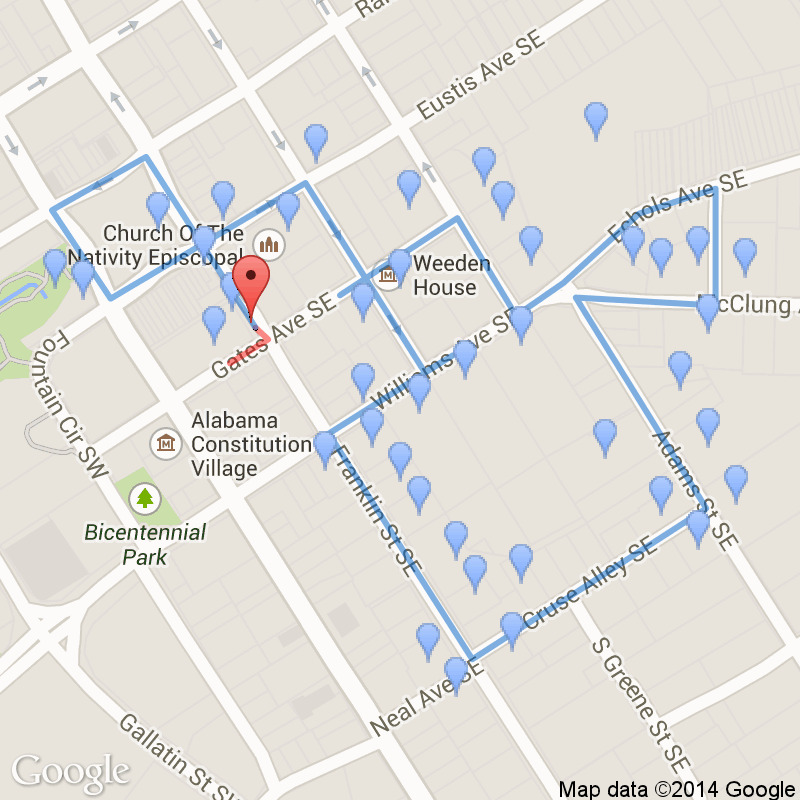 From Alabama Constitution Village, start walking in the direction of Franklin Street. Turn left on Franklin Street and stop. Alabama Constitution Village is where Alabama became a state in 1819. These buildings are authentically reconstructed to commemorate the 150th anniversary when delegates from all over the state met in the large Carpenter's Shop to write the first constitution. We hope you will return after the walk to enjoy the Village. Interpreters in period costumes depict life in Huntsville in the early 19th Century. 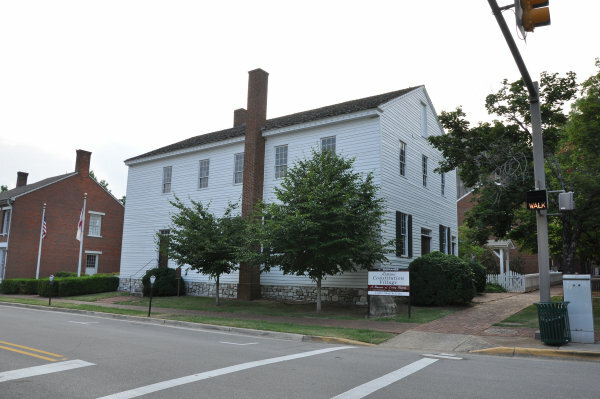 On your left, at the corner of Gates and Franklin, in this reconstructed large Carpenter's Shop is where the delegates worked many days and into the nights to write the State Constitution. Before statehood, the Alabama Territory had only limited rights of self government. 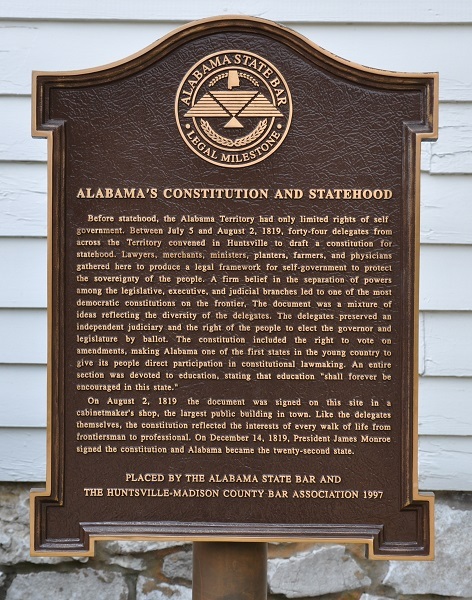 Between July 5 and August 2, 1819, forty-four delegates from across the Territory convened in Huntsville to draft a constitution for statehood. Lawyers, merchants, ministers, planters, farmers, and physicians gathered here to produce a legal framework for self-government to protect the sovereignty of the people. A firm belief in the separation of powers among the legislative, executive, and judicial branches led to one of the most democratic constitutions on the frontier. The document was a mixture of ideas reflecting the diversity of the delegates. The delegates preserved an independent judiciary and the right of the people to elect the governor and legislature by ballot. The constitution included the right to vote on amendments, making Alabama one of the first states in the young country to give its people direct participation in constitutional lawmaking. An entire section was devoted to education, stating that education "shall forever be encouraged in this state." On August 2, 1819 the document was signed on this site in a cabinetmaker's shop, the largest public building in town. Like the delegates themselves, the constitution reflected the interests of every walk of life from frontiersman to professional. 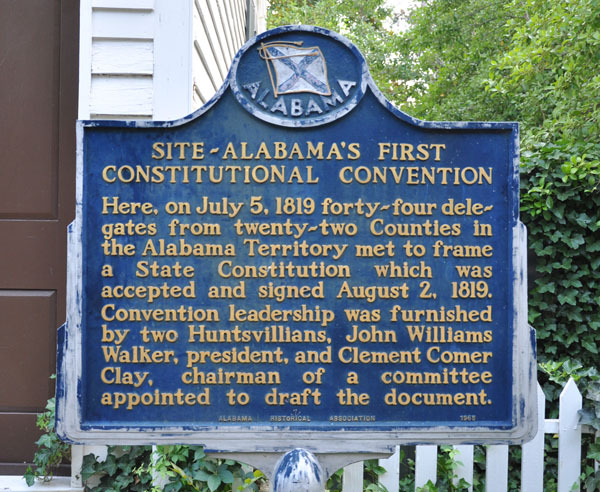 On December 14, 1819, President James Monroe signed the constitution and Alabama became the twenty-second state.